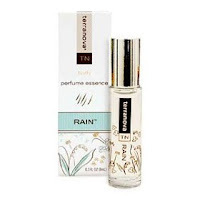 Derived from nature itself, Rain is a crystalline scent with notes of green clover, lily of the valley and just a hint of sheer musk. This very popular fragrance creates a sense of fresh, renewing clarity and is treasured for its ability to calm and rejuvenate. The purest, alcohol-free fragrance for a sensuous and lasting impression, it is presented in a small glass bottle with gold cap that goes beautifully into a purse or onto vanity table top. Made in USA.